Best mates Jimmy and Corgan have both dated Tamara. But now she's getting married to Jack, whom neither of them like. Since his brief teenage fling with her, Jimmy has realised he's gay, and has just told boyfriend Tim that he doesn't think he figures in his future. Corgan, meanwhile, has some mysterious injuries. Despite the show's title, Tamara's wedding hardly figures in this sharp, funny two-hander from Australian writer-actors Chris Isaacs and Jeffrey Jay Fowler. Instead, the nuptials form a backdrop for the ups and downs of Jimmy and Corgan's own meandering relationship – wild nights out, thankless hook-ups on Tinder and Grindr, damaging, ill-advised love affairs and, above all, a deep friendship. 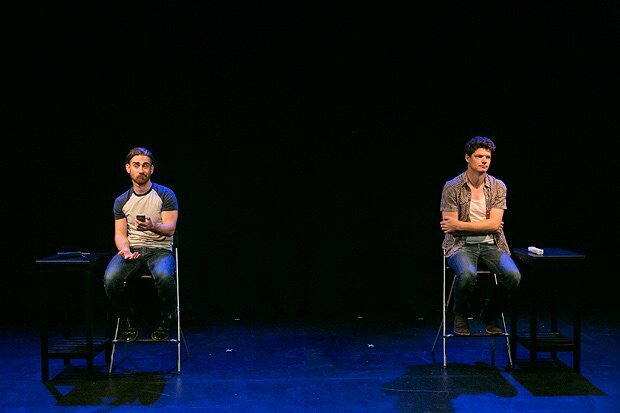 Isaacs and Fowler pull it all off with such cocksure, sarcastic humour that it's easy to overlook the more provocative themes that Fag/Stag tackles – shifting sexuality, loyalty, commitment. And by repeating key scenes from their contrasting perspectives, they generate big laughs at the discrepancies between them and reveal their individual insecurities. You're wondering, of course, whether the two guys will themselves get it together – but regardless, the show's ending is as inevitable as it is joyful. This is a very fine piece of work, which is frank, tender and thought-provoking. Underbelly Cowgate, until 27 Aug (not 14), 4pm, £11.50–£12.50 (£10.50–£11.50).